After months of planning, our annual music festival came and went in a blur. Andy Pickett played to a packed Chat Room on Sunday’s MAF18. Photo by Vishal Malhotra. I tried to do too much. At some point toward the waning hours of the Fort Worth Weekly Music Awards Festival (#MAF18) on Sunday, I realized that I hadn’t seen more than a few songs from each of the bands I had decided to watch. I was sitting comfortably in the air-conditioned Texas Silver Star Whiskey shuttle, cataloging all of the bands I’d seen to some unsuspecting couple who no doubt just wanted a break from any and all sound. If I had it to do all over again, I’d probably stay longer at each venue. I’d luxuriate in O. Deletron’s layers of dream-like melody and trippy, vintage visuals projected on the wall. I’d form a proper trauma bond with All Clean’s jarring, face-melting wall of sound. Heater, Summer Dean, Danni & Kris, Panic Volcanic, Cut Throat Finches, The Cush, and Royal Sons – you’re all like the distorted fragments of an amazing dream in my blurry Bud Light-addled brain. There’s only so much you can do and see. 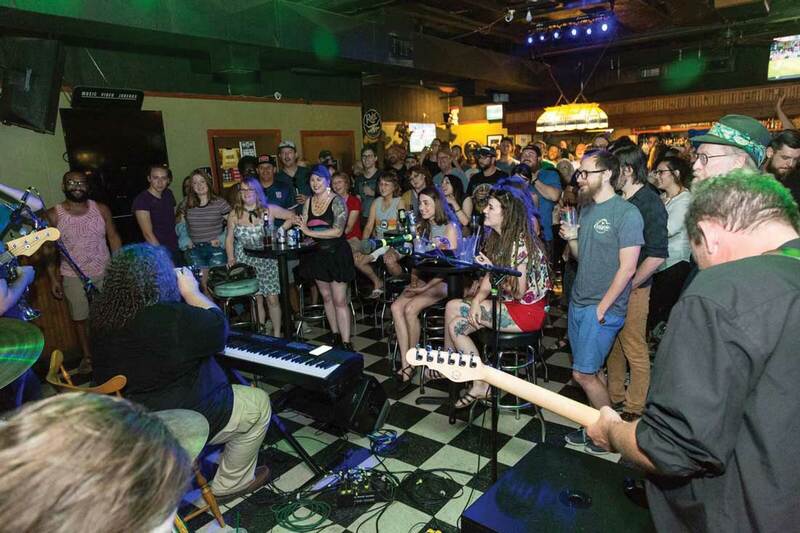 After all, if you’re a fan of local music, 40 bands converging on eight clubs over the course of five hours in the Near Southside is as daunting as it is thrilling. Around 4:30 p.m. at the Chat Room, I remember sitting with the lads and lass from the Funky Town Podcast lamenting all of the difficult choices the 17th iteration of our shindig presented. It’s a nice problem to have, right? I say it every year, and I’ll say it again now: The bands, musicians, venues, and music fans in this town are top notch. We have some of the best talent in the world hanging out in our little burgh, and that’s not just according to me. It’s also worth noting that every single person I encountered during the festival, from our small but mighty ragtag crew of Weekly volunteers to the musicians, stage managers, and soundmen, was enthusiastically pleasant. And that’s an important point, especially considering the bands were all playing for free and most of our volunteers were all spending their precious Sunday with the same people they see all week. I’d be punished (and dumb) if I didn’t mention our outstanding sponsors, without whom we couldn’t produce an event this size and keep it free to the public. Topo Chico and United Way of Tarrant County have also become stalwarts, and they deserve recognition. We owe a huge thanks to The Boiled Owl Tavern, The Chat Room Pub, Fairmount Music Hall, Main at South Side, Off the Record West, Shaw’s Patio & Grill, Shipping & Receiving, and Twilite Lounge. 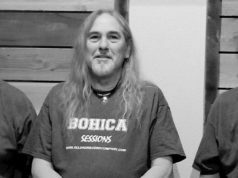 Every year we record a compilation album at Eagle Audtio Recording Studio composed of local acts and sell the recording to raise money for charity. Frequencies, Vol. 9 is available for purchase on Bandcamp and features Royal Sons, Juma Spears, Peter More, Danni & Kris, and more. The $5 cost benefits United Way of Tarrant County. At 6 p.m. on Sunday, July 8, the Music Awards Ceremony at the historic Ridglea Theater will be open to the public. The $5 entry fee also includes a copy of Frequencies, Vol. 9. I slowed my frenetic pace in time for the last bands of the evening. I watched Peter More’s whole captivating set at Twilite. I let myself be in the moment – no checking my phone, no taking terrible pictures for the Weekly’s IG, and no bothering the volunteers about how many albums we sold. For an hour, I let my neurosis cool and just listened to music. Finally. As always, thanks to everyone who came out to the festival, bought a copy of the compilation, or supports local music all year round. 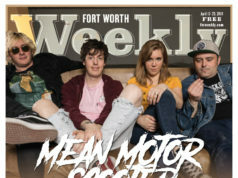 I wanna continue to do stuff with the FWWeekly. I love stuff!